Steve Kinniburgh felt Corby Town looked “strong” as they maintained their pursuit of Evo-Stik League South Division One Central leaders Peterborough Sports with a 4-1 success at troubled Aylesbury. Elliot Sandy hit a hat-trick and Connor Kennedy was also on target as the Steelmen stayed five points adrift of Sports who secured a 3-1 victory at Bedford Town. The build-up to the game had been dominated by the news that Aylesbury would be facing relegation regardless of where they finish in the table due to their inability to be able to achieve the ground grading required for next season. But Corby eventually showed no mercy on their hosts as they sealed a comfortable win. 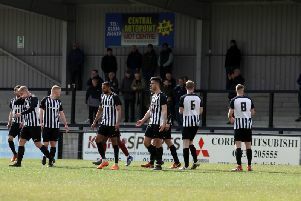 “We knew a lot had gone on at the club (Aylesbury) over the last week and that changes a lot of things when they aren’t essentially playing for a lot of points,” Corby boss Kinniburgh said. “It can change their style of play, they can be a bit more direct, they can afford to put more players further up the pitch than they normally would and they will give it a go. “But from minute one onwards, I thought we dominated the game. We had an offside goal, which looked like it was onside, we had a penalty shout and then we finally got the goal after their goalkeeper had made three terrific saves in the first half. “We came out in the second half and it was just about doing the right things. “When you are on a pitch like that, it’s very difficult to play your normal game and move the ball in the right areas and I thought we adapted very well. Kinniburgh took the opportunity to make substitutions with 20 minutes to go after his team had opened up a 3-0 advantage. The Steelmen are straight back into action at Welwyn Garden City on Tuesday night. And the manager added: “We were 3-0 up and fairly comfortable so we could get some of the boys off and give them 20 minutes less in their legs than they needed. “Joel Carta came back into contention and did well in his first game back and Jordan Francis had been ill all week and put a great shift for us.